On Thursday 9 November 2017, the European Parliament and the European Council reached a provisional agreement on preparations for Phase 4 of the highly controversial carbon market. While the compromise has yet to be made official, it is noteworthy because it marks the end of months of negotiations among EU member states, the Parliament and the Commission on the reform of the EU Emissions Trading System after 2020. 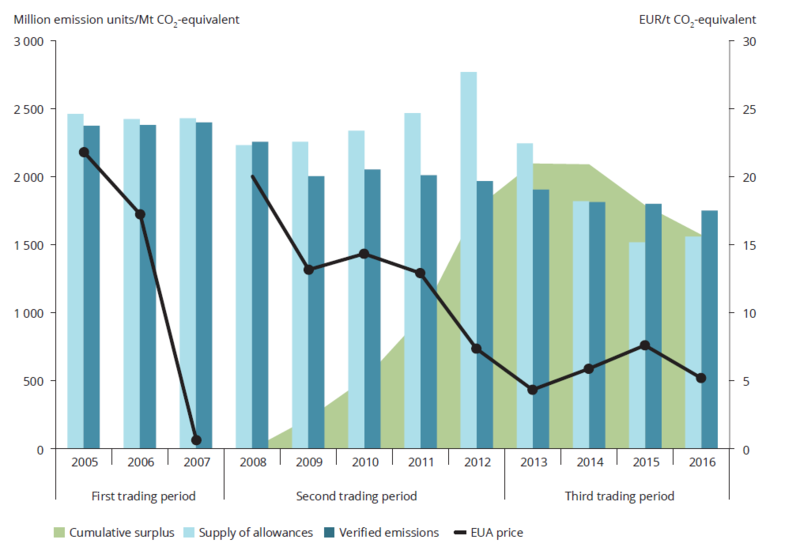 Since 2005, greenhouse gas emissions produced by major industrial companies and energy producers in the European Union have been subject to the EU's Emissions Trading System, better known as the ETS. The ETS is a practical application of the principle expounded in the 1960s by Ronald Coase, which states that optimal resource allocation always requires the explicit definition of property rights. As applied to the stock of greenhouse gasses in the environment, this gives a quota trading system in which major emitters acquire the right to emit a certain amount of CO2 into the atmosphere, either in the form of a free allowance or by purchasing it through the auctions organised by Member States. If the initial allowance does not match the company's actual industrial needs, any additional allowances required can be purchased and any excess allowances sold through the trading program. This system, known as “cap and trade,” has given rise to a price for carbon, which is decried both by those opposed to any mercantile approach to the environment and by partisans of the alternative solution of taxing each tonne of CO2 emitted at a level based on the environmental damage done by that tonne. The thefts and VAT fraud enabled by poor coordination of national policies have done nothing to improve the public image of the ETS. On the ETS, a single tonne of carbon currently trades at around €7. A disappointment for those who thought that the ETS would lead to massive investments in carbon-free technologies. At that price, fossil-fuel based production costs do not increase enough to justify dramatic shifts in energy sources. Low prices also come as a disappointment to the Member States which speculated on the billions of euros to be made on auctions to industries which are unable to offshore production, particularly the electric power industry. In fact, as any attentive shopper knows, prices are low when supply is high or demand is weak. On the ETS, supply is extremely high and demand is low. On the demand side, energy consumption is lower than expected due to a drop in economic activity across the EU. Demand has also been decreased by the support to energy efficiency (home insulation) and generous government subsidies for wind and solar power, which reduce the need for CO2 emissions allowances. On the supply side, behind a veneer of unity, national interests have led countries to allocate more emissions allowances than stakeholders really need. This has produced a reserve of unused allowances (named ‘cumulative surplus’ in the figure), which has grown so large over the past decade that it’s surprising that carbon prices have not yet hit zero. Source: EEA Report No 18/2017, "Trends and projections in the EU ETS in 2017. The EU Emissions Trading System in numbers." The European authorities have already intervened to boost prices by creating a reserve, inspired by the butter reserves created in the past under the common agricultural policy. To the best of our knowledge, there is nothing innovative about the agreement reached on 9 November 2017. It should, however, give the institutional machine a tune-up. First, it will accelerate the reduction in emissions allowed by raising the annual decrease coefficient for the volumes distributed and limit the number of free allowances. It also aims to make better use of the proceeds of the allowance auctions. During Phase 3 of the ETS (2012-2020), the volume of the allowances granted decreases 1.74% each year. Under the new agreement, the annual decrease will be 2.2% starting in 2021. Environmental groups say the new agreement remains inadequate: the annual decrease would have to exceed 4% to keep pace with the goals set during the COP21. The level of excess allowances in the reserve remains very high, on the order of a full year of emissions, despite the decrease in auctions agreed to in 2014. The agreement will double the volume of allowances withdrawn from the market and placed in the reserve, and stipulates that unused allowances will expire in 2030. The current ETS requires energy suppliers to purchase their emissions allowances through auctions. There is a loophole, however: under article 10c of the directive which created the European CO2 market (2003/87/CE), eight member States which joined the EU after 2004 may allocate free allowances to existing electric power plants. In exchange, these eight countries must draw up plans financed by the free allowances to modernise their electric industry and diversify their energy sources. It was agreed that this exemption could be renewed for the decade starting in 2020. But in practice, these Central and Eastern European countries, particularly Poland, Romania and the Czech Republic, used the money to subsidise coal-fired power plants, the total opposite of the actual objective of article 10c. The agreement reached on 9 November aims to prevent this type of misuse of resources in the future, which would entail verifying the reality of the modernisation plans discussed. Until now, European environmental policy on CO2 emissions reduction and policies promoting renewables and energy savings have been independent, with the renewables and energy savings policies cannibalizing rather than furthering the emissions reduction policies. This form of competition has generated downward pressure on demand on the ETS, because meeting green energy requirements means that industrial companies and energy producers use less fossil fuel, thus decreasing their need for allowances. Since the start of ETS Phase 3, however, a financial link between the two has existed: the NER300 programme has created a “New Entrants’ Reserve” financed by the sale of 300 million emissions allowances. This reserve is intended to fund the deployment of innovative renewable energy and carbon capture and storage technologies. It is too early to assess the programme’s results, since the projects funded will not be operational until sometime in 2018. The agreement reached on 9 November extends this model, calling for a Fund for Innovation in low-carbon technologies, to be financed by the proceeds from the auction of a defined volume of emissions allowances. The measures defined in the new agreement do constitute a move towards a decrease in CO2 emissions by industrial companies in Europe. While staunch environmental advocates will probably deem the decrease inadequate, if applied by all industrial countries (particularly China, India and the USA), it would offer a more optimistic view of the future of the planet. However, it will not necessarily lead to a significant increase in the price per tonne of CO2, which has stagnated at under €10 since the start of this decade. While they are reducing supply, the European authorities are also continuing to reduce demand through requirements on renewables and energy savings. Every closure of a coal or gas-fired power plant and every decrease in primary energy needs at constant service levels benefits the environment. But they also reduce the need for emissions allowances and drag down CO2 prices. Unless the EU follows the lead of England and Holland by setting a two-figure price floor, the ETS will most likely continue to stabilise at very low prices, which will be too low to trigger clean innovation. With the Fund for Innovation, the EU is creating a financial link between its CO2 emissions policy and support for low-carbon energy. This is where we will be able to assess the system’s degree of consistency. Until now, the industries that have prospered with the rise of subsidised green technologies were uninterested in the price of emissions allowances. By making the carbon market the funding source for innovative clean technologies, the reform will force these innovators to take the carbon market into consideration. With their support, a natural or artificial increase in price per tonne will become an urgent necessity. This is the solution proposed by Arthur Pigou in "The Economics of Welfare” 1920. Coase’s viewpoint is explained in “The Problem of Social Cost”, 1960. For example, €100/tCO2 is frequently cited as the price at which carbon capture and storage technology would become profitable (although that figure is difficult to verify). According to the Stern-Stiglitz Commission, carbon prices in line with the Paris 2015 agreements would be around $40–80/tCO2 in 2020, rising to $50–100/tCO2 by 2030. The graph shows that this was the case at the end of the Phase 1 of the ETS in late 2007. This volume would be 400 million tonnes, with an estimated revenue of 10 billion euros, according to “Briefing, EU Legislation in Progress", April 2017.